1998 Jetta TDI -- Biodiesel! 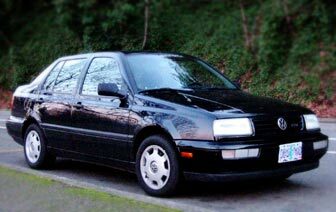 This is my 1998 Volkswagen Jetta TDI. The "TDI" stands for "turbo direct injection" which means that this is a diesel engine vehicle. As I've recently discovered in the last few years, diesel engines are no longer smelly, smokey, noisy old beasts. They are in fact at least 30-40% more efficient and cleaner burning than gasoline engines of the same size. And best of all, they can use vegetable oil as their fuel source. In fact the diesel inventor, Rudolf Diesel, designed the engine to run on veggie oil. Farmers could run their own tractors off spare oil from their vegetable crops. But then some corporations came along and decided that the common person should not be allowed to make fuel for themselves. The corporations found large oil reserves in the ground and the greed for "black gold" prevailed for many decades. But now biodiesel is being rediscovered... people are making it in their garages. Farmers are setting up million-gallon biodiesel processors to turn crops into fuel. Community co-ops are turning waste vegetable oil from restaurant deep fryers into cleaner burning, renewable, locally produced biodiesel. Biodiesel is ready to use TODAY! The combination of biodiesel's cleanliness and the VW TDI engine's efficiency makes this one of the cleanest vehicles on the road today. Biodiesel reduces greenhouse gas emissions (GHG) by 70-80%, so the Jetta TDI's petrol-diesel GHG rating of 4.9 tons/year is reduced to less than 1 ton/year. That's more thant 3 times less GHG emissions than the cleanest gasoline/electric hybrid! Now there are some areas where biodiesel is a bit dirtier. Biodiesel reduces particulate emissions (smoke) by about 30-40%, but that's still many times more particulates than gasoline engines. However, since biodiesel contains no sulfur, there will soon be devices that trap and reduce diesel particulates by 90 percent or more. That will make them cleaner than gasoline cars on all counts. Much of the electricity used to make hydrogen comes from coal-burning power plants. Add THAT to a hydrogen car's emission numbers! It takes more energy to make Hydrogen fuel than you get out of it. Biodiesel actually produces MORE energy than is used to make it. Hydrogen gas is explosive and dangerous compared with biodiesel. Biodiesel is very safe to store and will extinguish a lit match. Hydrogen cars are practically non-existent and quite expensive for their size, features and performance. New diesels are common and sold at average prices. Used diesels can readily be found in the newspaper for under $10,000. Since hydrogen doesn't contain as much energy by volume, hydrogen cars don't have very good range compared with liquid fuel cars. The current early production hydrogen cars will only have a 200-300-mile range, while my Jetta TDI easily gets 600 miles out of its standard 14-gallon fuel tank. Road trip! What do you think the resale value will be on a used hydrogen vehicle? Think of it like a computer, where its technology will probably be obsolete by the time it's sold new. Diesel vehicles, on the other hand, use basic technology so they will not be obsolete for decades. 20-year-old diesels are still in high demand. Hydrogen fuel will probably only be made by large corporations. Biodiesel fuel is simple and safe enough to make in your garage, or in a community co-op. GoBiodiesel Co-op in Portland, Oregon, where I volunteer and get my fuel.